(These are the only seasons that have been released by the studio. As police dramas go this show was a little light on substance. It was dubbed a “dramedy” because every episode included a healthy dose of humorous situations. 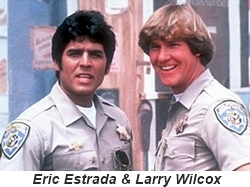 Officer Frank “Ponch” Poncherello (Eric Estrada) and Officer Jon Baker (Larry Wilcox) were California Highway Patrol (CPD) motorcycle patrolmen. Their territory was the extensive freeway system around Los Angeles. They dealt with a variety of incidents from humorous vehicle stops, to serious car accidents, and even some criminal activity. It was chock full of fiery crashes, wrecked cars and expressway tie-ups. Jon (Larry Wilcox) was the more serious officer while Ponch (Eric Estrada) was a bit more care free and quite the ladies man. The person responsible for keeping them both in line was Sgt. Joseph Getraer (Robert Pine) who gave them warnings and advice. A part of each episode would center on one of Officers personal lives, usually in a comedic fashion. There were of course some female Officers whose character would last a couple of seasons only to be replaced by another attractive actress. 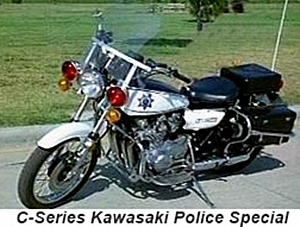 The first was Officer Sindy Cahill (Brianne Leary) who only lasted the first season and a half, then Officer Bonnie Clark (Randi Oakes) put on the uniform for 5 seasons and finally Officer Kathy Linahan (Tina Gayle) finished the series out. They played serious roles and were not merely window dressing. 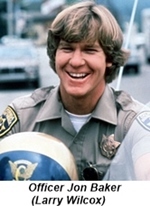 Larry Wilcox had a dispute with the producers and did not return for the sixth and final season. He was replaced by Officer Bobby “Hot Dog” Nelson (Tom Reilly). 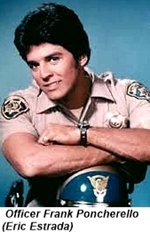 Eric Estrada also had a brief dispute with the producers and was immediately replaced by Bruce Jenner as Officer Steve McLeish, the dispute was settled fairly quickly and Estrada returned to his role. **For Trekies: Officer Jebediah Turner was played by Michael Dorn the same guy who played Worf in several Star Trek series. He has appeared more times than any other actor in the Star Trek franchise, spanning five movies and 272 television episodes in 2 different Star trek series (The Next Generation and Deep Space Nine). 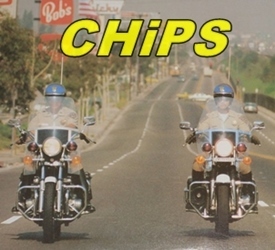 Eric Estrada had no motorcycle experience before CHiPS and even though he received 8 weeks of instruction he never felt entirely comfortable riding. 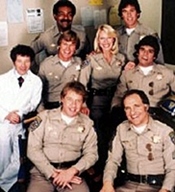 In August of 1979 Estrada was seriously injured while filming a scene for the upcoming season, fracturing several ribs and breaking both wrists. He was confined to a hospital bed for weeks but managed to shoot scenes from the actual hospital. The show wrote in the accident to explain the hospital scenes.